Combine the "Winter Waterfowl of the NC Coast" and the "Waterfowl Photography on the Eastern Shore" for a spectacular bird photography experience. I have chosen the Outer Banks of NC as my home because of its spectacular and varied photographic opportunities. 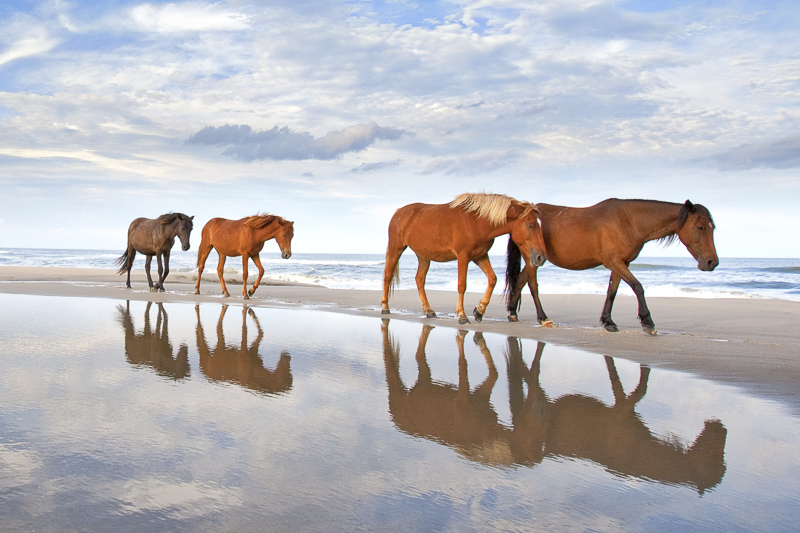 The Outer Banks is a 150 mile-long ribbon of sand that contains spectacular scenery...beaches, dunes, maritime forest, marshes, lighthouses and many other beautiful coastal landscapes. There is also a great variety and abundance of wildlife here to photograph. Within a two hour drive, there are 8 National Wildlife Refuges, 2 National Seashores, 5 State Parks and numerous other natural areas. This area of northeastern NC is popular among the birding community as a destination that produces a wide variety of birds throughout the year. Unknown to most visitors, the Outer Banks region is the wintering home of an extraordinary number of waterfowl (ducks, geese and swans). One one lake alone, each winter, you can typically find about 300,000 ducks and 30,000 tundra swans. This area is also home to the highest concentration of black bears in the world. It truly is a nature photographers paradise.